Note: Ensure you mark the referral Activity Type as "Available" (in the "Presentation" tab) in order for referrals to be detected. If an order happens to contain both (i.e. someone clicked on a referral tracking link but also used a referral discount code during checkout), the credit will go to the BrandChamp associated with the referral link. At this point it knows how many points to credit to the BrandChamp, but it does not apply them immediately. It waits 14 days by default after the referral was detected so that if an order is changed or canceled, the BrandChamp receives the correct amount of points, or none at all if the order is canceled later. You can change the number of days to wait before applying commissions in the Settings area. 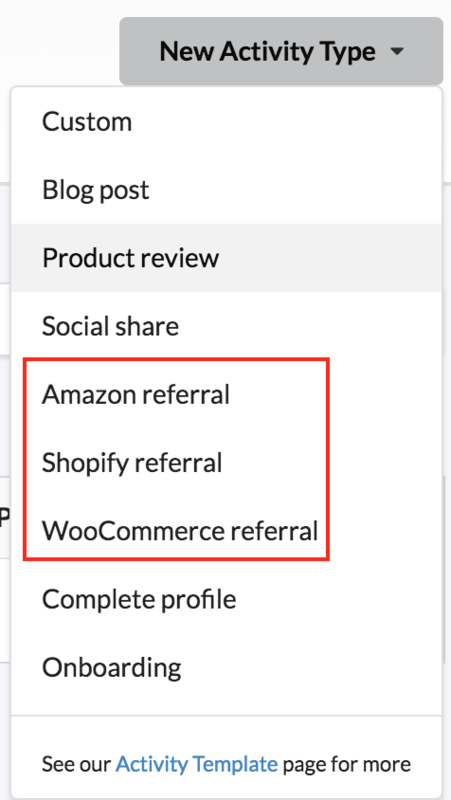 Say you configured a Shopify referral Activity type so that it gives 10% of a referral order value to BrandChamps as commission, and converts every one dollar in commission to 0.5 points. And let's say on January 1st, the system detects a referral order with a total order value of $100 linked to BrandChamp #1. Then, as long as the order is not edited further or canceled, BrandChamp #1 will receive 5 points ( (10% of $100) * 0.5 ) on the 15th of January. When a referral order is detected, the system also checks to see if there is anything suspicious about the referral. For more information, see the Suspicious Referrals article. One of: "approved', "denied" or "undecided". See the Suspicious Referrals article for more details. The customer details from the e-commerce order. If any details match those of the referring BrandChamp, the order will be flagged as suspicious. See the Suspicious Referrals article for more details. How much monetary commission was calculated from the order total (minus any order discounts). Monetary commission is always converted to corresponding points (shown in next column) which are then credited to BrandChamp's on the "Due On" date. The amount of points calculated from the monetary Commission amount in previous column. The order date according to the e-commerce system. Note: this might be earlier than the date BrandChamp actually received it or detected it as a valid referral (For example, only orders marked as "shipped" are considered valid for referrals). BrandChamp will calculate the "Due On" date from the time it's first detected as a valid referral within the BrandChamp system, and not from this order date. What date the referral commission points will be applied to the BrandChamp's account. By default, this will be 14 days after referral is detected in the BrandChamp system. You can control this in the Settings area. Whether the referral commission points have been applied to the BrandChamp's account.